Traveling to Italy and starting to plan your trip to Rome? Feeling overwhelmed by all the thing to see and do, by what to pack and what to wear in summer and winter, by how to get by with the traffic and public transport? As we’ve been living in Rome for years, we have experienced pretty much every season so we can give travellers tips any time they decide to visit the Eternal City. Nowadays, most world airlines fly to Rome. If you are travelling from another European capital, you might want to check low-cost airlines like Vueling, EasyJet or Ryanair. If you are travelling from another Continent, you will need to take a bigger airline that sometimes will have a layover in their country’s capital. Some of the best and most popular airlines to travel to Rome are Alitalia, Etihad, Emirates, Turkish Airlines, Qatar Airways, Tap, Lufthansa, Delta, Air China, Singapore Airlines. If you are already in Italy, we suggest reaching Rome by train as it’s a handy, more affordable as well as more eco-friendly option. Companies like state-run Trenitalia and privately-owned Italo Treno cover a wide network all throughout the country. Trenitalia reaches and stops also in small villages, while Italo only big cities. On RailEurope website you can find the routes and the fees for both Trenitalia and Italo Treno. Depending on the season, you pack different. If you are coming in summer, don’t forget sunscreen and sunglasses, while if you are planning to travel in autumn, an umbrella is a must. For every season, however, there is a general list to keep in mind. With so many things to see and do, making your travel plans can be difficult. Even though we give you all the tools and info to plan a trip to Rome your own, we also suggest some great tours, most of them lasting a couple of hours or one day. These will help you discover sides of Rome you can otherwise neglect, seeing the city in different angles as well as exploring different neighbourhoods. If you would rather plan your trip your own, we have written a detailed Rome guide as well as a guide outlining how to best visit the Vatican and all its landmarks and also what to do if you are thinking about spending Christmas in the city. If you need some themed itinerary to spruce your trip up a bit, here are three, or if you want to visit some lesser-known places, here are some hidden gems. 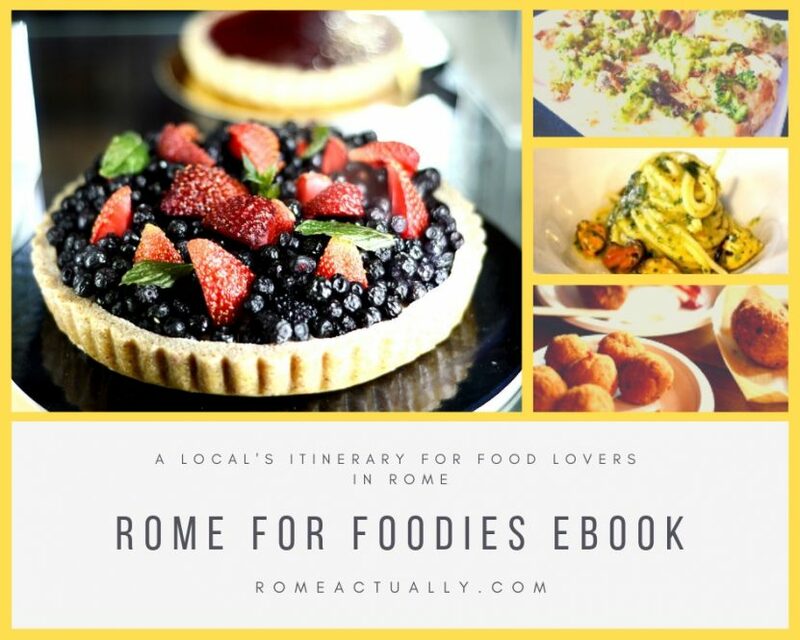 Our eBook “Tasting Rome by Neighbourhood” suggests five daily itineraries to discover as many neighbourhoods with the best restaurants and things to do in the area. You will find out what is new, exciting and different in the Rome food scene with a wide range of different restaurants, eateries, ice cream shops, coffee shops. All styles, preferences and dietary needs are covered with traditional restaurants, contemporary, fusion cuisine, fish and seafood dishes, foreign flavours. Being Rome so big, often tourists are unsure where to book their hotel to be close enough to the famous landmarks but also in a nice and quiet neighborhood and possibly without spending a fortune. That’s why we suggested some of the best areas to book a hotel and what to see nearby. There are many types of hotels you can book in Rome, budget, luxury 5-star resorts, B&Bs or apartments if you prefer the privacy of a home. Or you can pick your accommodation by neighbourhood. To make things easier, we have created a section devoted to Rome accommodations. Rome is the political as well as culinary capital of Italy. Whether you are looking for traditional Roman cooked in the traditional way or with a contemporary twist, or a pizza Roman-style or the Naples way, a good Chinese, some Indian curry flavours or a vegan meal, in Rome you will find anything. You just need to know where to look. We suggest you avoid the immediate tourist areas, but we understand that it’s not so straightforward to know where to go. Besides, also the city centre boasts some pretty great eateries. We hear and we decided to sacrifice ourselves for you and review what we consider the best restaurants in the city to give you tips on where to eat.